Say hello to the most gorgeous kitchen appliances your eyes have ever seen. The wonderfully made and aesthetically appealing products come from SMEG, a brand with a mix of retro and modern appliances for your everyday use. While KitchenAid might dominate the world of mixers, we could make a good argument for SMEG taking its place with these beautifully bright colors. Smeg is a brand manufactured in Italy, and is popular abroad in countries like the United Kingdom, France, Spain, the Netherlands, Germany, South Africa, and so many more. It has since grown in the United States with its nostalgic, 1950s appearance. Smeg appliances are top-rated and their nontraditional colors make for a surprising brightness in any kitchen. We know it can be a bit overwhelming to search for small domestic appliances, so we've condensed the search for you. Take a look at these ten domestic appliances and get to ooh-ing and aww-ing. You can prop your bread up and let them cool on this stainless steel bun warmer. Easy for getting breakfast ready for the family, too. You can set them out and let the folks grab them before spreading with delicious jelly! This is one of those understated small appliances that makes mornings easier. There is something stunning about the colors of the Smeg toasters. This is the perfect introduction to the compact products that Smeg offers. This toaster is also available in black, pink, red, and pastel blue. I'm not sure if tea tastes better when the water is boiled in cute appliances. However, we can make the assumption and run with it since this style range is gorgeous. 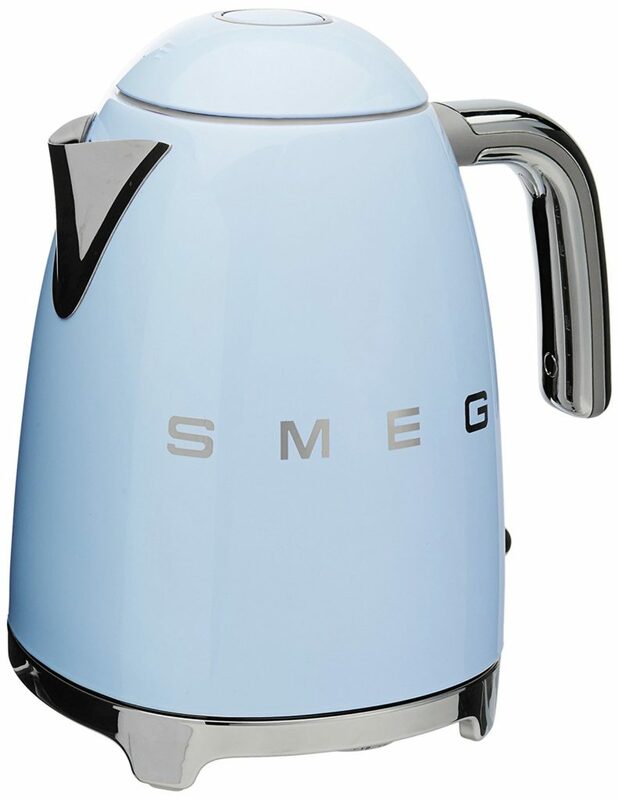 Get this retro Smeg kettle in chrome, cream, black, red, pink, pastel green, and pastel blue. Blend smoothies, shakes, and more in this sleek blender. This is one of the star characters of the Smeg lineup because it's highly functional. This is one appliance that should live on your countertop because of the brightness it brings to your domestic space. Show your kitchen what has been missing all this time. It's also available in cream, pastel green, red, and balack so there's something for everyone. Again with the color - this mixer is really architecture and art meets function, and the Smeg head pop of color puts even KitchenAid stand mixers to shame. This magnificent and clean mixing stand will be the perfect assistant in whipping up delicious treats. Make room in the main fridge and snag this cutie to store your drinks and extra items. This is also available in red, black, and orange. Know someone in need of some extra room? This compact refrigerator is perfectly quaint. It's one compact refrigerator that will keep on trucking for a long, long time. Starting that healthy lifestyle would be so much easier if we had this juicer. I might not want to drink my spinach and ginger but making it is fun with this thing. If you're looking for something tiny and cute, this citrus juicer is your saving grace for fresh-squeezed orange juice every morning. If you're in need of something a little more grand, this full-sized refrigerator is it. It's equipped with a top-freezer and glass shelves. It's also available in black, yellow, and pastel green. This is the ultimate retro item for your kitchen. This is the most treasured item of them all. This appliance is for the ultimate cook. The multiple stove and griddle combination allows you to cook most things all at once. Splurge now when you need a new range, and love it even more later.